Minister Gilad Erdan demands action against organization hosting Rasmeah Odeh, who carried out an attack in Jerusalem and murdered two Jews. A conference led by terrorist Rasmea Odeh, a Popular Front for the Liberation of Palestine (PFLP) terrorist who in 1969 murdered two Jewish college students and injured nine others in a Jerusalem bombing, is scheduled to take place in Berlin on Friday. 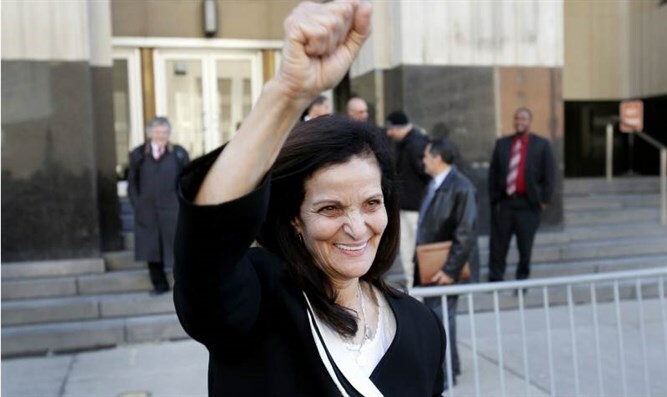 Odeh was convicted of murder and sentenced to two life terms for the terrorist attack. In 2017, Odeh was ordered to leave the US by a federal court in Detroit after she lied about her involvement in terror in Israel to illegally obtain US citizenship. She was deported to Jordan in September of that year. In recent years she has become a sought-after lecturer at conferences held by organizations which promote the Boycott, Divestment and Sanctions (BDS) movement, including on campuses. In light of her activities in the boycott campaign against Israel, the terrorist appeared in a recent report published by the Ministry of Strategic Affairs under the heading "Terrorists in Suits", which revealed the links between the Hamas and PFLP terrorist organizations and the BDS organizations. Strategic Affairs Minister Gilad Erdan passed on the report to more than ten ministers throughout Europe, in countries where the boycott organizations are active, demanding that the organizations and boycott activists mentioned in the report relating to terrorist organizations not be legitimized. The report was also handed over to the German Interior Minister. Friday’s event in Berlin is organized by the Samidoun organization, which also appears in a report published by the ministry because of its deep ties to terrorist organizations. The organization presents itself in Europe as a legitimate human rights organization, but in practice maintains a strong network of contacts with PFLP which is declared as a terrorist organization in the United States and the European Union. The report also revealed that Samidoun activist Mustafa Awad had undergone training by Hezbollah in Lebanon and transferred money from Lebanon and Syria to a PFLP activist in Belgium. Awad is currently in prison in Israel. Erdan demanded on Thursday that countries in the world increase their activity against the anti-Israeli organizations. "We will continue to expose the true face of the BDS organizations and act to stop the funding given to them. It is inconceivable that terrorists who portray themselves as ‘human rights activists’ will exploit freedom of expression for purposes of terrorism and incitement. I turned to my colleagues in Europe and asked them to put an end to the BDS fraud and halt their activity, including stopping funding for them," Erdan said.